I am so happy to share this one with you. I found it a couple of years ago when I was tired of cooking the same thing all the time, yet I need recipes that are easy and fast. Taste is an added bonus because frankly one of the kids will complain no matter what it is. 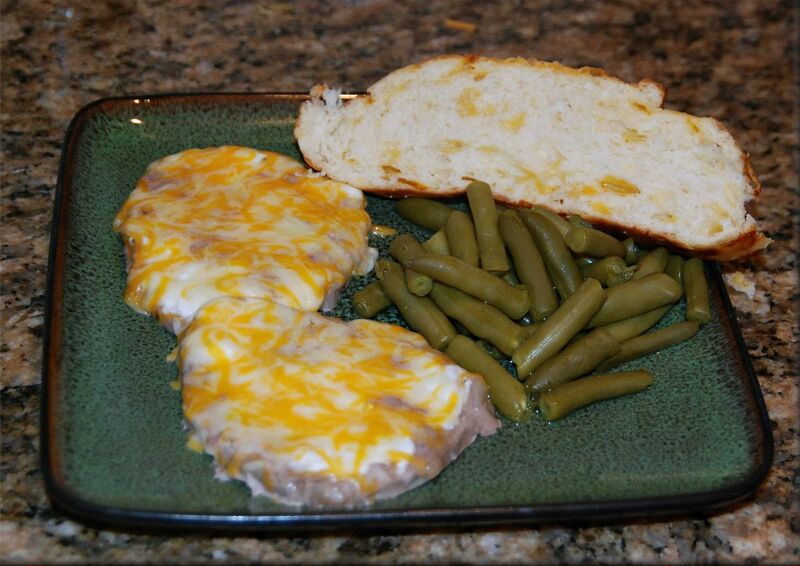 The first time I made the Cheesy Pork Chops I was blown away. Just those few ingredients made something this delicious?? Yes it did. And we’ve been in love ever since. Line the pan with your chops and sprinkle with your favorite seasoning. Smother with 1 tsp sour cream per chop. 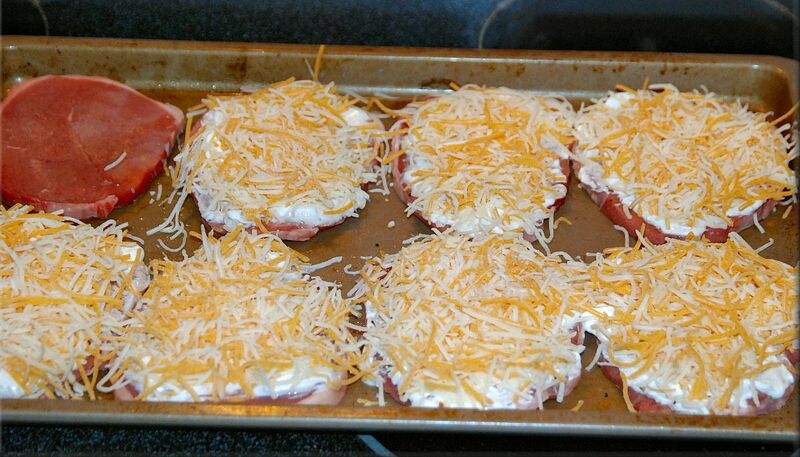 Add enough shredded cheese to cover the top. Bake at 350. Adjust the cooking time to the thickness of the meat. Thin pork chops are done in 15 minutes. For an inch and a half of chop, I’d bake for 35 – 40 minutes. Ready to eat out of the oven. I know, right? Too easy to be delicious. Surprisingly, it’s not! (Although did you notice that one sad naked pork chop? Yes, one child out of 5 still complains about “stuff” on her meat. That’s fine, it’s easy to just leave one alone! Great recipe! Cheese and pork are a happy couple indeed! I currently have this in the oven and I can tell I’m going to love it already. Thanks for such a great, easy recipe! YUMMY!!! I was at first a little skeptical because cheese and sour cream don’t really top my list of things to add to pork chops. I usually just pan fry them and add dill. This was a hit with my 7 year old and I can’t wait for lunch tomorrow….Easy clean up and easy tummy pleaser. Thanks for sharing. Michelle, I KNOW!! I was so skeptical the first time I made them too! And they are EASY! bonus! I love finding recipes like that! Is there a print link for this recipe? It looks delish! Your email says there are print links embedded in the recipe posts. Where can I find that? Or, how can I print the recipes? Thanks! This was so good my family loved them now that I know how tasty and easy I will make more because they were asking for it the whole meal with some pasta that i threw some roasted peppers in to 30 min graeat job keep them coming! This came out so good! These look AMAZING! It’s what’s for dinner tomorrow night! And I’ll have a couple of “naked” ones for my two Pickies! 🙂 Thanks for sharing!!! My husband despises pork chops, but they are so cheap I can’t afford not to buy them. Everytime I make pork chops he wines lol. Well today was no different waah waah and I told him shut up and try it! He loved it and wanted seconds!!! Thank you so much! I have made this twice and its been a husband pleaser both times. My 17 month old is not a big meat eater and she even ate this last night because it is so tender! Thanks! Best ever !!!! I was skeptical at first wondering how it would taste!! My family gave it a perfect score! I rarely comment on food… but yours was awesome! I added real bacon bits at the end and browned it all under the broiler .. ohhhhh soooooo good !!!!! My husband LOVES this recipe and now this is the only way we eat them! Can you do this in the instant pot?